The Boys in the Boat is a well-researched, gripping and inspiring narrative about UW’s eight-man crew’s quest for rowing excellence and the roles played by the boat designer, coaches, rowers, and coxswain in that journey to gold. Brown’s spellbinding account takes place in the 1930’s when the United States was suffering through the Great Depression, Germany was seeing the rise of the Third Reich, and rowing was enjoying popularity second to only track and field among Olympic sports. Not long into The Boys in the Boat, I discovered that it was not going to be easy to put the book down. Brown is an enthralling storyteller, and he offers great insights into life, as well as rowing. Take, for example, what the master boat builder, George Yeoman Pocock, had to say about the primary traits of a high-performing rowing team -- “Harmony, balance, and rhythm . . . there you have it . . . that’s also what life is all about.” That insight, as well as others regarding teamwork, patience, persistence, and preparation, is one of many from The Boys in the Boat that apply to fundraising. 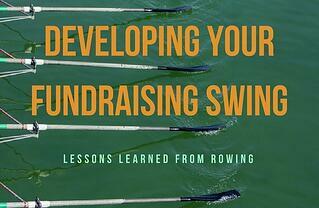 What can we learn from The Boys in the Boat about developing that swing in fundraising? I believe Brown’s book points to four key elements: skills, shared vision, self-discipline, and trust. Skills – Everyone on the fundraising team – institutional chief executive officer, development staff, volunteers, counsel – has a particular role to play. The rest of the team relies on that individual to apply his/her unique skills to that role, whether its casting the vision for the institution; guiding, managing and evaluating the fundraising process; strategizing and carrying out the cultivation, solicitation and stewardship of donors; or building trust and confidence in the institution. Shared Vision – Just as the boat builder, coaches, coxswain, and oarsmen were singularly focused on getting to and succeeding in the Berlin Olympics, so too must the fundraising team be committed to the institution’s core values, guiding mission, and aspirational vision. Self-discipline – The quest for excellence required the “boys in the boat” to devote themselves to the hard work of improving their skills, taking and acting on constructive criticism, and learning to pull together in harmony, balance, and rhythm. Such discipline is also required of a successful fundraising team. Trust – Rowing is built on trust. The coaches rely on the boat builder to craft a worthy vessel. The oarsmen and coxswain look to their coaches to meld them, with their individual abilities and personalities, into a competitive team. The oarsmen, all facing away from their destination, depend on the coxswain, the smallest and least powerful person in the boat, to direct their actions and lead them to the finish line. Excellence in fundraising requires similar deep trust from the full development team – institutional executive leadership, development staff, volunteers, and counsel. As I learned from reading The Boys in the Boat, it is not a book just about rowing. It has a lot to teach us . . . and inspire us . . . about life . . . and fundraising. I highly recommend it.